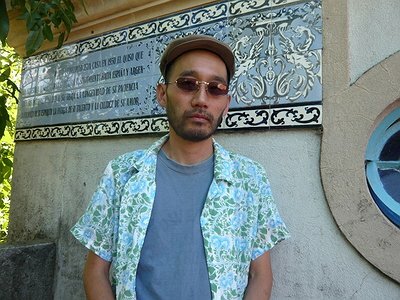 Musical Recommendations: Tetuzi Akiyama – both a great artist and a great friend of mine. I originally started using a mixer to play music in 1995 as an extension of my guitar playing. In 1997, I unplugged my guitar from the mixer to concentrate on the mixer itself. It was then that I finally felt free from the guitar and discovered music away from a musical instrument. As I stopped playing the guitar, which I had played for nearly twenty years, the technical side of the influences I had gathered until then did not continue. But my aesthetics I have now should be an accumulation of all things I liked and disliked before. It is an audio mixer with some effect pedals to obtain feedback sounds. I named it “no-input mixing board”, because there is no external sound source such as samples, musical instruments and microphones to the mixer. The relationship between my instrument and myself is pretty much equal. I have to resign a great deal of determinacy in the music to the system of the instrument, be obedient to the result and accept it. Wanting to sound like myself, getting fed up with it at some point, trying out something else. When it comes to the decision when you produce your sound in the music, there is no difference between improvising and playing compositions. You have to make the right sound at the right moment. But those two things are different in approaches toward the creation of music. When you compose a piece of music, you create a system before you and other performers (if there are any) play your music. I would like to avoid that sort of situation. I still have a naive fantasy in improvisation that there is more freedom than in playing compositions, and even more freedom than in actual life. I would like to be as free from any system and structure as possible. I know freedom is just a fantasy, and it is not really the thing you should seek for in music making. But still, I would stay away from compositions. I don’t think I have a strategy that I can explain to you at the moment. I will usually go in to the space for soundcheck prior to a show, look around, tell the technicians where I would like to be situated and how my sound should come out, and such sort of things. I basically agree with these two points, which Mr. Stevens defined as his rules for playing in his ensemble. But Tetuzi Akiyama and I do something opposite to them sometimes. I will play really really loud so nobody including ourselves can hear Tetuzi for a while - but Tetuzi just carries on playing. But perhaps we do it because we have been long standing musical partners for each other for a long time, so we are kind of a group. It is only another way of playing music in a particular group. There is no difference between improvising and playing compositions. You have to make the right sound at the right moment.